Bookburners: “Wax” by Andrea Phillips. Season four, episode 7. Apologies for this review being late! Somehow I keep running behind. 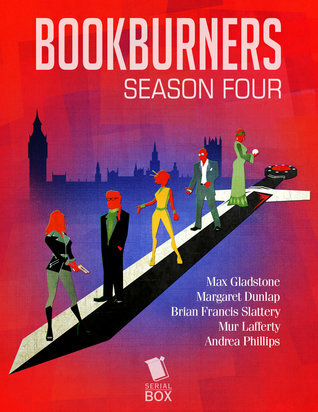 Before I dive into this episode, if you’re not familiar with Bookburners, it’s an urban fantasy serial story that I’m quite a fan of! You can see my review of Season One here. Note, this review will contain spoilers for all previous episodes. What does the title, “Wax,” make you think of? I saw it and immediately thought of Grace: dear Grace, who’s probably my favorite character in the whole series. How is it that nobody but her and Sal seem concerned with her candle (and her life) burning down? I mean, to be fair, the fate of the world is a worthy distraction. Still. I want Grace to live a long and happy life, and that means finding a way to break her tie to her candle. “Wax” brings in a figure from Grace’s past, the wizard who created the candle as a means to semi-immortality. Who knew he was still alive? Not me, that’s for sure. Anyway, he is alive and has been living off the so-called charity of some nefarious Swedes. In a blatant attempt to stir the pot, they let him know the location of Grace… and her candle. But Grace has other problems to worry about. A magical storm is about to hit London. London’s already got all sorts of magical problems, and it’s about to get a whole lot worse. The Bookburners team needs to alert authorities, organize an evacuation, and get ready to fight whatever magical monsters pop up. Oh, and Sal’s upset that Perry won’t evacuate, even though the storm’s sure to play hell with his magical allergy. It’s always hard to review Bookburners episodes. How do I discuss them fully without giving away spoilers? What results is some unsatisfyingly vague statements. And you’re about to get another one: I really liked how this episode dealt with conflict. It’s kind and honest and an emotionally hard-hitting sort of resolution that isn’t completely dependent on punching (not that this episode doesn’t have punching). It’s my favorite part of the episode. But this episode also doesn’t provide a resolution to any of the long-term conflicts of the series. The world is still in danger. Grace is still cursed. While those remain true, there may be hints as to how things can get better. I trust Team Three can figure it out.